A slick heist movie, Ocean's Eleven makes good use of a high-wattage cast and an energetic tempo to deliver a stylish romp through Vegas. 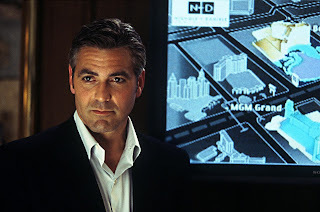 Danny Ocean (George Clooney) is released from prison on probation, and immediately sets about planning a mega-heist. His plan is to break into the safe at the Bellagio hotel in Vegas, which conveniently also holds the cash for the Grand and the Mirage, and take off with $100 million. The three hotels are owned by Terry Benedict (Andy Garcia) who has claimed Danny's ex-wife Tess (Julia Roberts) as his own. Danny is more interested in recapturing Tess' heart, but will also take the money just to spite Benedict. 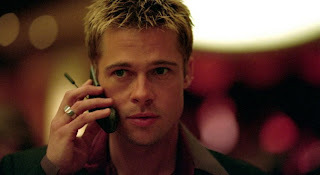 Ocean and his main buddy Rusty (Brad Pitt) set about assembling a crew of eleven men to plan and pull off the theft. The team includes pickpocket expert Linus (Matt Damon), inside man Frank (Bernie Mac), explosives expert Basher (Don Cheadle), and the Malloy brothers (Casey Affleck and Scott Caan), greasy jack-of-all-trade types. They are funded by money man Reuben Tishkoff (Elliott Gould), Benedict's rival in the Vegas hotel ownership business. On the night of a world championship boxing fight, the gang hit the Bellagio while Ocean attempts one last time to win Tess back. Compared to the limp 1960 original, the 2001 version of Ocean's Eleven positively sizzles. Director Steven Soderbergh briskly handles the team-assembly bits and promptly places the emphasis on planning the theft. Enough clever innovation, unpredictable creativity, and shiny technological touches are embedded into the plan to make it reasonably feasible by the standards of high-budget movie fiction. The final hour is given over to the heist and its aftermath, Ocean and the gang coolly navigating the labyrinth of the Bellagio's hidden chambers to break into the best protected vault in the world, accompanied by the velvety smooth David Holmes music score. The all-star cast play it surprisingly straight, with Clooney, Pitt and Damon graciously allowing the lesser lights plenty of screen time. Roberts has the least to do but still sparkles in her few scenes, while Garcia's beady eyes and tight jaw mercilessly capture then devour enemies. Ocean's Eleven is star-studded, entertaining, and quick-paced, and attacks the house odds with gusto.